The Government of Andhra Pradesh has released G.O No.132 dated 06-07-2016. 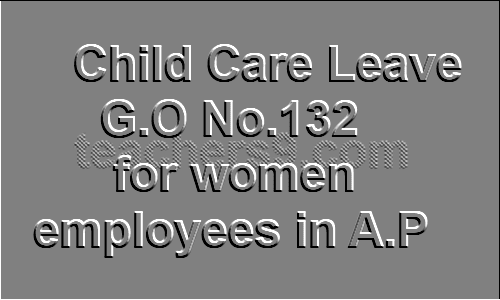 As per this G.O No.132, the women employees be permitted to avail child care leave for two months viz., sixty days in the entire service to take care of the minor child for rearing or for looking after any other needs of the child during school or college examinations, sickness etc. Child Care leave of two months can be sanctioned in not less than 3 spells to look after two children up to the age of 18 years and with disabled children up to 22 years. The Child Care leave would be permitted only if the child is dependent on the Government servant. LTC cannot be availed during the Child Care Leave as the leave is granted for the specific purpose of taking care of the minor child for rearing or for looking after any other needs of the child during examination, sickness etc. The leave account for child care shall be maintained in the prescribed proforma enclosed and it shall be kept along with the Service Book of the Government servant concerned. The leave shall be deducted from the Child care leave account. The Head of the office shall ensure that the availing of Child Care leave to an employee will not affect the functioning of the office for which necessary orders depending upon the circumstances of the office may be issued. Child Care leave cannot be demanded as a matter of right. It requires the prior proper approval of the leave sanctioning authority. The Child Care Leave may be sanctioned in continuation with maternity leave or any other leave other than Casual Leave and Special Casual Leave. The Child Care leave can be sanctioned during the period of probation also. However, the period of probation shall be extended to that extent. The Child Care leave can also be allowed for leave not due. What is the certificate needed to upload in the APTels app to apply the childcare leave..